What is the Chicken Inferno? No post tomorrow, since we’ll be enjoying a long weekend as we bring Mason out to the country for his first Chicken Inferno. What is this Chicken Inferno, you ask. Well, hold on to your hats, because you’re about to get a glimpse into the lives of the Core Team that you may regret. The Chicken Inferno is a celebration of food, fun, and flames inspired by the infamous Burning Man project. 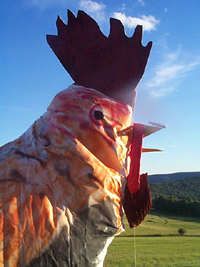 Since the setting of our ritual conflagration is rural Pennsylvania, we thought that some sort of barnyard fowl might an appropriate effigy. Every year, on the third weekend of July, friends and family convene from across the country to build and then burn a giant chicken. Last year’s burnt offering (our best yet) was roughly 30′ long and 10′ tall. Oh, and we stuffed it full of fireworks. Ultimately, the Chicken Inferno is good, clean family fun. What, after all, is more wholesome than building a giant chicken out of wood, hay, and chicken wire, and then burning it? We must be doing something right, since this will be the sixth annual Inferno. Where Are You Birding This Final Weekend of July 2012? Where Are You Birding This Third Weekend of July 2012? Hark, a Lark (Sparrow)! Make That Two!